Maytag Commercial Manual Stacked (2 x 9kg) Programmable Electric Heat Washer/Dryer. Go to the Richard Jay website for more info here. 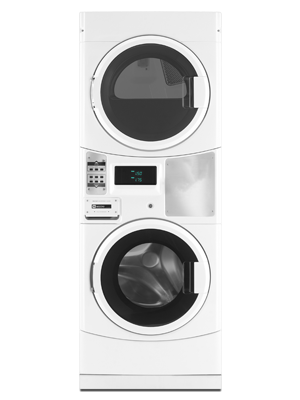 The smart space saving MLE20PN stacked washer & dryer takes up half of the floor space of a conventional full size washer & dryer pair, making it easier to fit into smaller laundry area. Despite the smaller floor space needed, the washer still has a large 8.5kg capacity, with the dryer also having a 9kg capacity. This washer & dryer pair are designed with energy and water efficiency in mind, saving you up to 60% on energy and water costs, while still having built to last toughness that only Maytag can deliver.